En route to the airport leaving Budapest, I was angry. Not with the glorious palace-turned-hotel we had called home for two nights. Not with the strolls we took through ancient neighborhoods and certainly not with the gastro-fab cuisine. No. I was annoyed with myself for only allocating one full day to Budapest on our summer odyssey through Europe. When revealing our summer plans, many friends wondered, why Budapest? 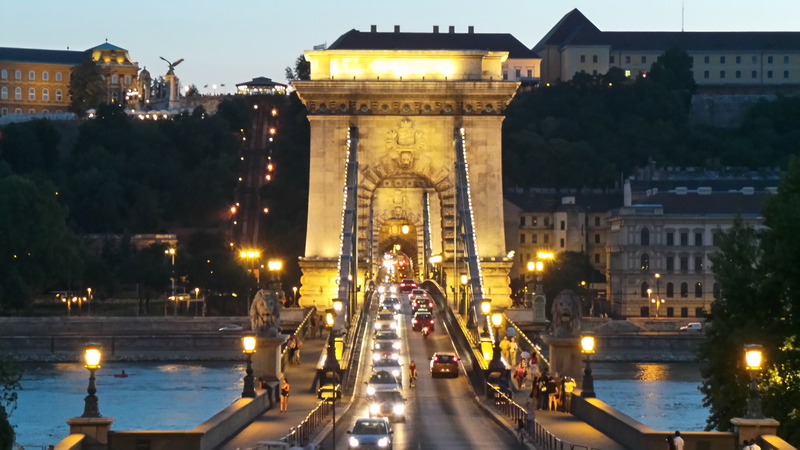 Budapest holds the allure of the City of Light minus the attitude. Dubbed “The Paris of the East,” the city’s grand tree-lined boulevards, landmarks, museums, impressive architecture and artsy cafe culture were enticing. We had the great fortune of staying at the Four Seasons Gresham Palace. Turn of-the-century elegance emanated from the lobby’s Beaux-Arts mosaic floors and soaring glass ceilings. Our room was equally stunning with views of the Danube River, Chain Bridge and Buda Hill. Though we wanted to luxuriate in our quarters, I rallied the troops and we set off to explore the Castle District. We crossed the Chain Bridge from Pest to Buda and boarded the 19th-century funicular which crept up the hill to Buda Castle. From here you can explore the castle, historic squares and museums and catch the dramatic changing of the guard at the Hungarian Presidential Palace. Under the castle is another world, a medieval labyrinth of caves and cellars. Sightseeing batteries can be recharged at Ruszwurm Confectionery, a sweets institution since 1827. Returning, we spied a rickshaw under the Four Seasons awning, an amenity for hotel guests. I hopped on with my daughters and we were whisked down lively Zrinyi Street to St. Stephen’s Basilica and a nearby fountain where kids enjoyed gelato and frolicked in the water. The food in Budapest was a happy surprise. A melange of Hungarian specialties, grilled meats, pastas, soups and pizzas easily satisfied the family’s palate. Standout local dish? A soft-as-butter pork indigenous to Hungary called Mangalica. The hotel cafe serves a delicious Mangalica Pork Trio. Other standouts are Hungary’s robust condiments. We discovered one purveyor of cold-pressed oils, Podor, at the hotel restaurant. After a sampling, we were the proud owners of 15 bottles of assorted oils, vinegars and pestos. Now that is mom’s kind of souvenir! Next time: Budapest is famous for its public bath houses. Underground caves create highly mineralized water renowned for its healing powers. There are some from the Turkish period, and modern 20th century baths. The pools are open to the public (kids are welcome) with a purchased ticket. The two that caught my eye were the ornate Gellert Baths and Szechenyi.